PREBLE COUNTY — Preble County had a banner year in the track and field arena. Within the county, one state champion was crowned while three more athletes qualified for state and 16 others made it to the regional meet. Aaron Deaton, a junior, won the state championship in shot put with a school record throw of 56 feet, nine inches and also competed in the discus. It was the first state championship since 2004 for Twin Valley South. Deaton was a guaranteed point getter for the Panthers all season long, usually guaranteeing between 18-20 points per meet. 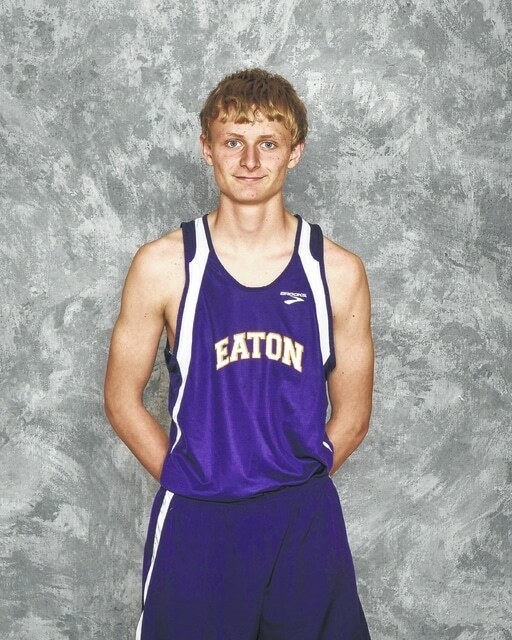 It is this consistency – and gold medal – that earned Deaton the All-County Player of the Year for the boys’ track season. Deaton also placed first in the district and regional meets in shot put while taking first in the discus at regional with a personal best throw of 165 feet, two inches. Joining Deaton is senior Austin Johnson from Tri-County North. Johnson placed eighth at the state meet in the 300-meter hurdles. He won the district race and took fourth at regionals before pulling out his finish at the state meet. Johnson also competed in the 110-meter hurdles and was part of the record-breaking 4×200 meter relay team at North. Reynolds placed first in both the 110 and 300 hurdles and took fourth in long jump at the district meet. At the regional meet, he took third in the 110 and eighth in the 300 before placing seventh at the state meet. Reynold’s teammate, Darius Spears also makes the cut. He was a prolific thrower for the Eagles and placed third at the district meet with a toss of 43 feet, eight and one-fourth inches. He also medaled at the regional meet, placing eighth with a throw of 46 feet, three and one-fourth inches. Drew Campbell, a junior Eaton Eagle, joins our All-County team for his high jump. Campbell took fourth in the district meet with a jump of five feet, 10 inches. He also competed at regionals, placing 15 overall with a jump of five feet, eight inches. Eaton’s top pole vaulter, junior Seth Wright, also makes the cut. He placed first in the district meet with a vault of 13 feet, six inches and took sixth at regionals – just missing the cut for state – with a vault of 13 feet, four inches. Senior Zavier Spears rounds out the list for the Eagles. He was solid in the 400-meter dash for Eaton and competed at a high level in the sprints. Spears took fourth at the district meet in the 400 while placing 11th in the 100-meter dash and 13th in the 200-meter dash. At the regional meet, he finished 15th in the 400. J.J. Utz, a junior from Twin Valley South joins the team as well. Utz was the top 800-meter runner for South and competed on two relay teams – the 4×400 and 4×800 – that advanced to the regional meet. He won the district meet and finished tenth in the 800, sixth in the 4×400, and 11th in the 4×800 at regionals. Utz is joined by Tristen Sizemore from Twin Valley South. Sizemore was the another productive thrower for the Panthers, and took second in both the shot put and discus at the district meet behind Deaton. He also reached the podium in both events at regionals, taking sixth in shot put with a toss of 47 feet, two and three-fourths inches and fifth in discus with a throw of 140 feet, seven inches. Also on the All-County team from South is junior Luke Stoner. Stoner was a hurdler and pole vaulter for the Panthers, competing in the 110 and 300-meter hurdles, as well as the pole vault at the district meet. He was third in the 110-meter hurdles, fourth in the 300-meter hurdles, and ninth in pole vault at the district meet. He finished ninth in the 110 hurdles and 11 in the 300 hurdles at regionals. Brad Green, a senior, was the top 400-meter dash sprinter for South and was also a member of their 4×400 relay. He was third in the 400 at districts but pulled up with an injury during the 400 finals at the regional meet. He still managed a sixth place finish and reached the podium. Rounding out our team is Trey Summers, Billy Daugherty, and Garrett Woodyard from Tri-County North. These three members, along with Johnson, were part of the record-breaking 4×200 relay team at North. The 4×200 relay team placed first at the district meet with a time of 1:34.04 before taking fifth at regionals and missing the cut for the state meet by .46 seconds. Summers, a senior, also competed in the 4×100 relay team, which took eighth at the district meet. He did the shot put and long jump too, placing 10th and eighth respectively at districts. Daugherty, a junior, was also part of the 4×100 team and competed in high jump at the district meet. Woodyard, a junior, was a solid 400-meter runner for North, placing fifth at districts. He was also a member of the 4×400 relay team, who placed eighth at the district meet.